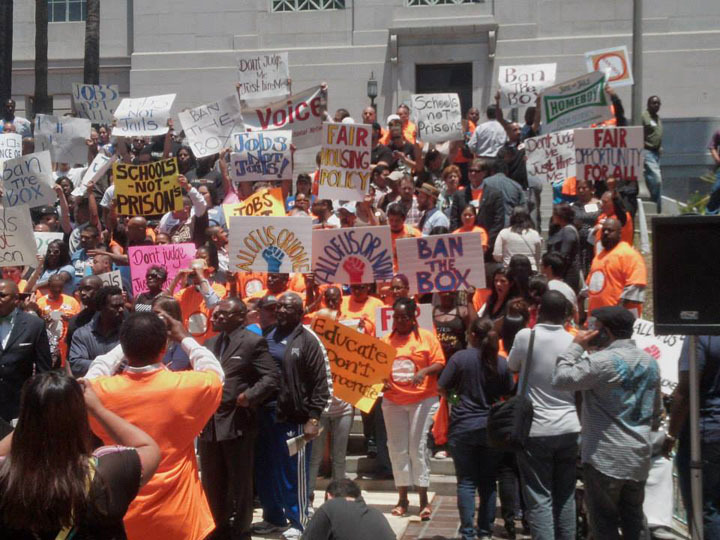 More than 200 people, including a coalition of grassroots activists and families of the formerly incarcerated, rallied at City Hall recently to introduce Ban the Box to Los Angelenos. The Los Angeles and Long Beach chapters of All of Us or None, a national initiative started by formerly incarcerated people and their families in 2003, spearheaded the June 6 action in downtown Los Angeles. Ban the Box is a national campaign designed to eradicate seven little words: “Have you been convicted by a court?” It’s on applications for employment, housing, public benefits, insurance, loans, and other services. The question seems simplistic, but it’s what stands between ex-offenders and any potential opportunities for them to begin new lives through employment or find safe places to live, even after they have paid their debts to society through incarceration. “Many people are affected by the question on the application,” said Fanya Baruti, organizer with the All of Us or None Los Angeles/Long Beach Chapter. He said the main point of the rally was to help people understand that the question has been a big issue for formerly incarcerated people for decades. “Why does this have to be there? Can you get to know the person and their expertise first,” Baruti asked of employers. L.A. Black Worker Center, Los Angeles Regional Reentry Part­nership, and Public Counsel Shields for Families. Until All of Us or None raised the issue in 2003, no one had spoken out on the problem, according to Baruti. The initiative began the Ban the Box campaign after learning that job and housing discrimination were major barriers to formerly incarcerated people’s successful re-entry into their communities. The campaign champions job selection based on skills and qualifications, not past convictions, according to campaign coordinators. Initially, it focused on employers, mainly on government agencies and public hiring practices, to educate public officials about the needs of communities they served. To date, more than 45 cities and counties, including New York City, Boston, Philadelphia, Atlanta, Chicago, Detroit, Seattle, and San Francisco, have stripped the question from employment applications, according to the campaign. Critics of Ban the Box argue eradicating the ability for employers to conduct criminal background checks puts companies and their employees at risk. Job givers have a right to know who they’re considering for hire and protect themselves, critics say. The Ban the Box coalition countered the goal is to ensure formerly incarcerated people have a chance of getting hired and are not penalized for past mistakes long after they’ve rehabilitated. Part of its efforts include a petition Ban the Box petition at MoveOn.org. “One out of every 12 people you know is a convicted felon and must check the "yes" box on applications. This question allows application screeners to discriminate against felons regardless of their rehabilitation status,’” reads the petition in part. “We know that sensitive information, vulnerable populations, and valuable property are three main components for which employers can most definitely say we need to do a background check,” Baruti said. “But we also ask what is the qualifying apprentice that someone has, and can you put that on a notice so people don’t waste their time,” he said. Rehabilitated, former drug offenders applying for jobs as sign hangers shouldn’t be denied opportunities for employment, Baruti exampled. In addition, the campaign wants companies to allow rehabilitative measures to be attached to a person’s character. For instance, such measures could be accepting reference letters from pastors or civic leaders. “Statistics all around have shown that most people that get a job who were formerly incarcerated end up being some of the best employees of the company,” Baruti said.